Jon Simmons, lead vocals/guitarist for indie-rock act Balance & Composure from Doylestown, PA, stopped by Penn State to play SPA’s noontime series to a relaxed audience located in the HUB. His setlist included original songs and covers that covered different decades of artists before him. State In The Real caught up with Jon to talk to him about him playing his first show and what is going on with B&C. SITR: I am here with Jon from Balance & Composure. How are you doing today? Jon: Pretty good, I am doing alright! SITR: You said that was your first acoustic show. How was your anxiety level coming into playing for SPA’S Noontime series especially? Jon: It was very scary pretty much the whole time but I had a great time doing it as well. A good first show. SITR: Do you usually do off-shows like this at your leisure? Jon: No and that’s why I took advantage of me playing whatever I wanted to play. I’ve always wanted to play a bunch of covers in a set so it was a lot of fun. SITR: Let’s talk about Balance & Composure and the release of Separation. How have the fans perceived about it? Jon: The kids have been really awesome about it. It seems the feedback has been well so far with the reception of the record. 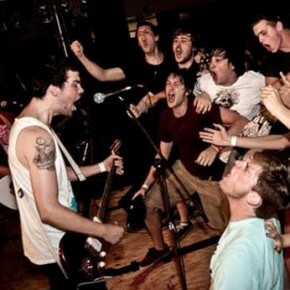 SITR: You have been playing shows with the likes of Senses Fail/Saves The Day. Also, recently doing a mini-tour with I Am The Avalanche. How was that by the way? Jon: Awesome. Perfect shows and they were a lot of fun opening for them. They are one of my favorite bands so it was awesome playing with them. SITR: You were on a UK tour with Title Fight and Transit. How was that and what spots did you hit? Jon: Amazing! We hit the UK, Czech Republic, Switzerland, Germany, Austria, Holland. Never thought I could go overseas and play music so it was cool to be over there. One of my favorite times of the past year. SITR: What is on the slate for Balance & Composure in 2012? Jon:We will be going on a spring tour with La Dispute, Sainthood Reps, and All Get Out. Other than that, I don’t think any new music will be recorded for the time being.